This dish best reflects my state of mind these past few days. I’m sure this picture or some variation of it shall remain tucked back behind my retina somewhere for many months to come as it guides another kind of inner vision. Spring is finally here once again, and yet I am looking toward autumn and the bounty of that season, as represented through the sharing of an abundant harvest. I’m amazed at how quickly things change as only last week I was focused entirely upon spring and cherry blossoms, asparagus and impending garlic scapes. I’ve come to realize that when you invest that creative and most personal part of yourself in what you love most and share it with others, people notice even if you do not know they’re watching. This coming autumn shall bring with it a new experience that both intimidates and excites me. I have been invited to teach a vegan cooking class representing the wholesome bounty of botanical foods at the venerable and world-class Rancho La Puerta spa. The motto of this amazing place is “siempre major” which, when translated, means “always better”. In order to achieve this goal, the founder, Deborah Szekely, also maintains that there needs to be constant change. Having recently reinvented my own world and redefined my place in it by adopting a compassionate lifestyle coupled with respecting my body through exercise and conscious nourishment, I have lost nearly one hundred pounds and have never felt more energized physically, mentally or spiritually as I do now. I eagerly look forward to meeting this remarkable woman and the opportunity to share my own passion for compassionate whole foods with her and her guests. When I see a trough or bowl-shaped food, I immediately start dreaming of ways to fill it and make use of the natural vessel. This recently happened with a gorgeous deep-orange piece of Hubbard squash. Clean the squash, removing any seeds and stringy material from the inside. [If the squash is thick-skinned, like a butternut, peel it. If it has a softer and edible skin when cooked like an Acorn or a Hubbard there is no need to peel it and actually is a great fiber source.] Lightly spray the squash with olive oil and sprinkle with a pinch of salt and black pepper. Roast until the edges are browned and the squash is fork-tender. This should take from 45 minutes to an hour depending upon the thickness of your squash. While the squash is roasting, pour the balsamic vinegar into a small pan and add the sugar. Simmer on medium low heat until it has thickened enough to coat the back of a spoon. Set aside. Pour some olive oil into a small pan and heat to medium. Place the sliced garlic into the hot oil and cook until they begin to turn golden. [Do not let them get too brown or they will be bitter. The now garlic-flavored olive oil should be reserved and used for other dishes or in salad dressings.] Drain on a paper towel. Spoon a teaspoon or so of the olive oil used to crisp the garlic slices into a small pan and sauté the orange segments until warmed. 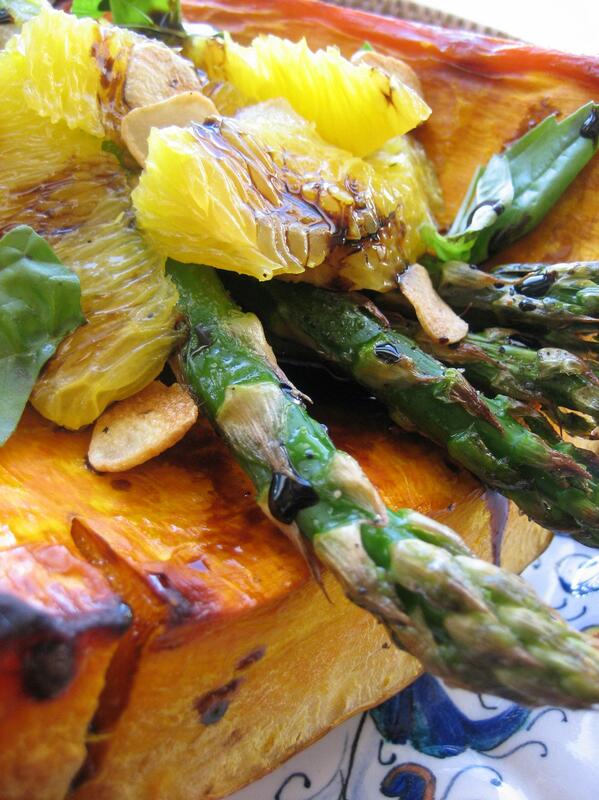 Place a piece of squash on a plate, trough or bowl shape up, and lay the roasted asparagus and oranges atop. Garnish with the garlic chips, torn basil leaves and a drizzle of balsamic syrup. Ok, this looks wonderful! I cubed up 2 Butternut squash yesterday and then oven roasted them, so I’ll be using that for my squash. Thanks for sharing this recipe. Congratulations on the cooking class! If I lived closer I would sign up. Thank you. I hope you enjoy it, it’s a feast for the belly as well as the eyes! I am so going to make this soon since I have a butternut squash in my fridge. Oh and I forgot to reply on the last posting I commented on, but I will definitely take you up on the offer to watch you cook! I’m still incredibly intrigued by the tofish.